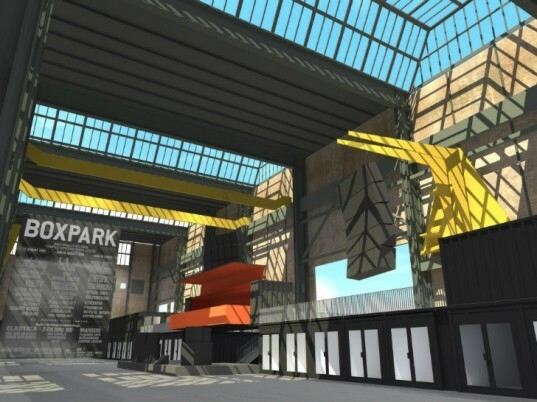 Boxpark Shipping Container Mall to Pop Up in NDSM Shipyards in Amsterdam Next Year! 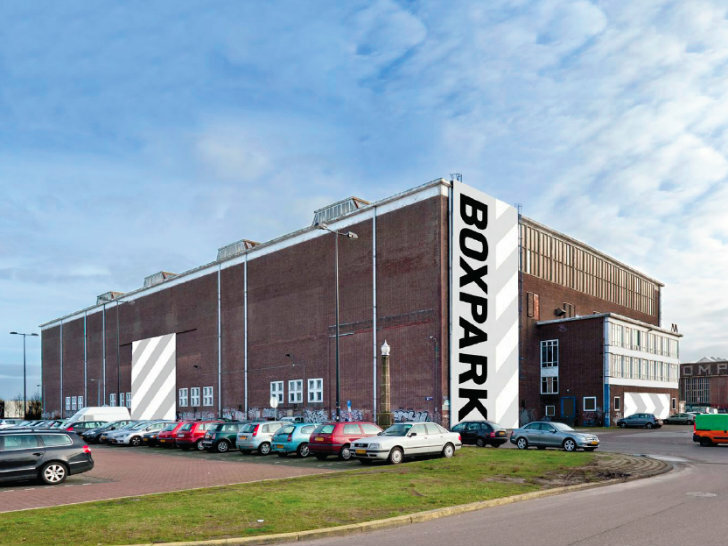 Boxpark has plans in the works to open up a 2nd pop-up shipping container mall - this time in Amsterdam's underutilized shipyards. Boxpark NDSM will be located inside the immense Lasloods building, which was used to do finish work and final welding on ships back in the day. The temporary shipping container mall is expected to open in the summer of 2013 with 120 spaces for retail, restaurants and bars. Property investor and developer Corio is working in conjunction with Boxpark and London interiors and retail designer Brinkworth to design and build a pop-up shipping container mall in Amsterdam’s shipyards. Boxpark NDSM will be located to the north of the center of Amsterdam in the shipyards and is accessible to visitors via a free ferry across the canal. The shipyards are undergoing a period of transition as it changes from a place of industry and fabrication to one dedicated to commerce, business and entertainment. The container mall will be located in the Lasloods building, which is a large brick warehouse that was used as the welding hangar to finish the ships. The unique building retains the original character and is lit from above with large skylights. The space is currently utilized for indoor fairs, flea markets, concerts and other events, but the mall could help make better use of the space. Boxpark will open next summer with 120 container spaces on two levels in a C-shape inside the building and will provide space for retail shops, restaurants and bars. Unlike Boxpark Shoreditch in London, NDSM will be indoors and will not be as affected by adverse weather. The covered and protected space can hold a large amount of people for a variety of events all supported with a strong commercial core. Property investor and developer Corio is working in conjunction with Boxpark and London interiors and retail designer Brinkworth to design and build a pop up shipping container mall in Amsterdam's shipyards. Boxpark NDSM will be located to the north of the center of Amsterdam in the shipyards and is accessible to visitors via a free ferry across the canal. The shipyards are undergoing a period of transition as it changes from a place of industry and fabrication to one dedicated to commerce, business and entertainment. The container mall will be located in the Lasloods building, which is a large brick warehouse that was used as the welding hangar to finish the ships. The unique building retains the original character and is lit from above with large skylights. The space is currently utilized for indoor fairs, flea markets, concerts and other events, but the mall could help make better use of the space. Boxpark will open next summer with 120 container spaces on two levels in a C-shape inside the building and will provide space for retail shops, restaurants and bars. Unlike Boxpark Shoreditch in London, NDSM will be indoors and will not be as affected by adverse weather. The covered and protected space can hold a large amount of people for a variety of events all supported with a strong commercial core. The large skylights of the warehouse will provide plenty of natural daylight within the open space.